DataContract serializer (xml files) is still being used as the default serializer in Wave Visual Editor. This is useful to inspect scenes or upload your game project in a Version Control System (Git for example). Protobuf-NET serializer is only used when our project is compiled and run outside of Wave Editor. In order to avoid serialization problems using Protobuf-NET, we encourage you to avoid this following scenarios in your Component code. Try to avoid using [DataMember] attribute with an object type variable/property. This will not cause an error. But different behavior between DataContract and Protobuf can be noticed. 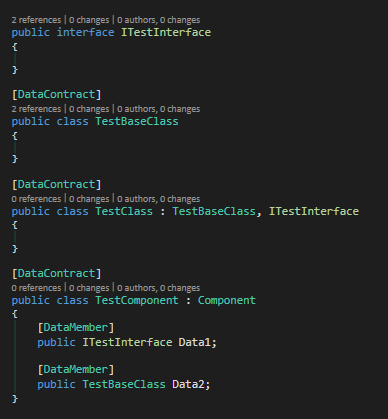 Protobuf handles interfaces as base classes, so [DataMember] attribute cannot be used with the implemented interface and the base class at the same time. Protobuf-NET is now the default WaveEngine serializer, but you can revert this situation and turn back to the old DataContract serializer.